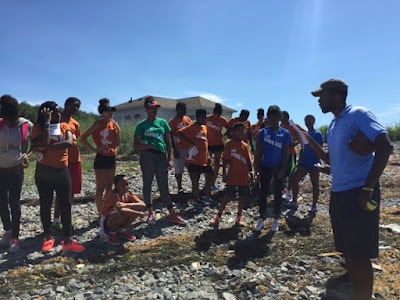 Sea, Sand & Sky: The amazing race CHV! Here at CHV the kids of each light house participate in a huge race around the island. There are stops on the island that they all must complete team building activities at. 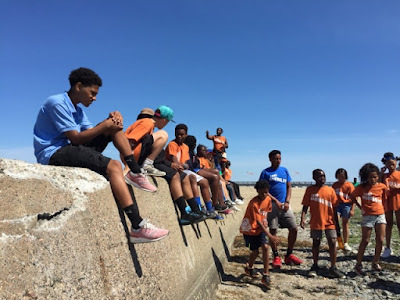 The Save the Harbor crew was set up along the sea wall and our task was having the kids look for five items in the intertidal zone. They were looking for a piece of trash, a brick, Asian shore crabs, mussel shells, and a piece of wood. We wanted to have them find items that would get them familiar with their beach, and what can be found there. After the groups found the items they were given a clue! Ahmed explaining the task for the kids to complete. When they worked together as a group, they were able to find the items quickly and earn their next clue. After they are given the clue, they had to find the bunker on the island and the item they were looking for was at the bunker. Listening to their next clue.